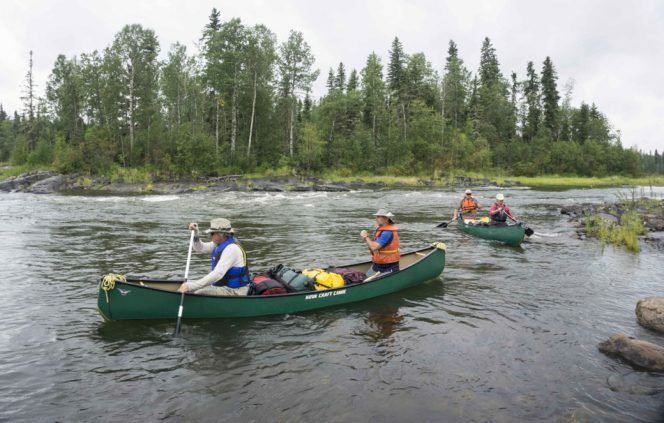 Canoeing the Canadian Shield — a neophyte paddler turns voyageur in northern Saskatchewan. I have always dreamed of tackling the classic Canadian canoe adventure: paddling epic rivers, running rapids, camping and fishing. You know the drill. So, I didn’t hesitate when I was invited by my friend Damon on a week-long canoe trip in northern Saskatchewan. Our goal was to follow a historic water route taken by Indigenous trappers and their families, coureurs de bois (entrepreneurial woodsmen of French origin) and Hudson’s Bay traders. Here’s a look at our trip after-the-fact — along with a few words of advice for other neophytes who, like me and in spite of their less-than-expert paddling ability, are determined to experience this quintessential Canadian undertaking. 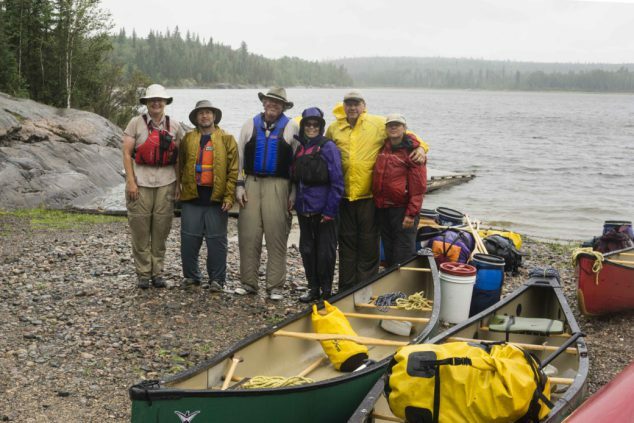 Our paddle pals, two expert canoe couples from Saskatchewan who are tough as nails, supply food, canoes and paddles. As a result, packing for me is pretty much a cinch. I pile my gear into my hatchback head out on the 12-hour-plus road trip from Calgary to Missinipi, a northern settlement on Saskatchewan’s Otter Lake. I bring all of the essentials necessary for a Canadian summer backcountry adventure, including dry bags, life jacket, water shoes, tent, sleeping bag, ThermaRest mattress, toque, down jacket, gloves, rain gear, flip-flops, tank top, sarong and last but definitely not least, Courvoisier and chocolate. We sort our gear as a group before departure and I’m informed that most of my dry bags are useless for the challenges ahead. I’m given what could be Paul Bunyan’s dry pack which swallows my personal belongings but swings awkwardly from my narrow shoulders. It’ll have to do. A perfect windless, blue sky day graces our departure. “You’re going to be sorry with all that gear on the portages,” a dockhand remarks as we load the single turbo Otter and nestle our three canoes on the plane’s two floats. My companions joke about how tough we are. I trust that they know what we’re getting into because I sure don’t. From the float plane, I have a bird’s-eye view of the country we’ll paddle through. Nothing but lakes, rocks and forest for as far as the eye can see in any direction. I am in awe of the magnitude of the wilderness below. 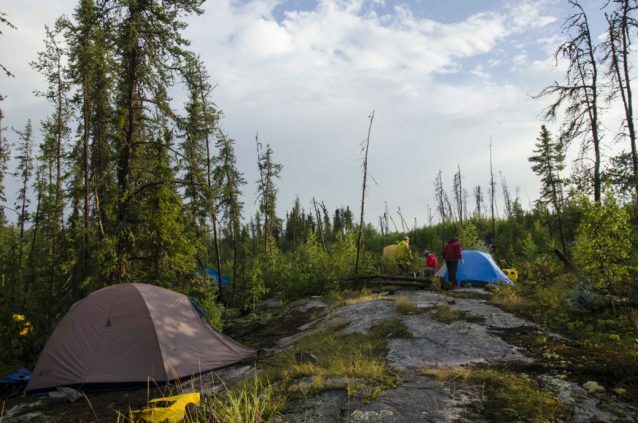 Before long, we land on Hickson Lake about 155 kilometres northeast of Otter Lake, where we’ll return in seven days as we paddle the Paull and Churchill Rivers. First Nations canoeists paddled these same rivers as they moved from summer to winter camps. They also employed these waters for commerce, long before the route became a veritable highway during the fur trade era. 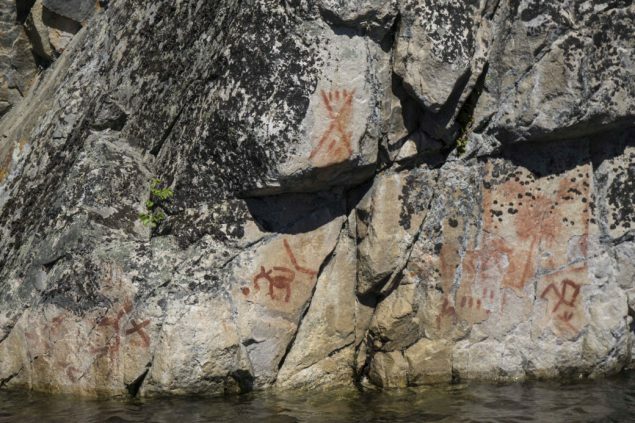 We find echoes of this history in the pictographs painted in ochre on the cliffs along Hickson Lake. Making and breaking camp brackets our days of canoeing and portaging. One evening, we find ourselves paddling into a blinding sunset, making it difficult to identify features on land. But we need to get settled before nightfall so we resign ourselves to camping on shoreline where fires had ravaged the forest, leaving little room to pitch one tent, let alone three. Our companions expertly clear space for their tents, pitch them, bathe, set up the kitchen, make a fire and cook smoked pork chops. Meanwhile, Damon and I struggle to pitch our tent and, upon being summoned for dinner, agree that the location we choose will have to do. We toss our gear into our quarters for the night and join our paddle pals for food and wine, then Courvoisier all around. A fitful, lopsided sleep follows. We dine on pickerel caught straight from the lake. We fillet and lightly season it, throw it in a frying pan on the grill and often feast within an hour of it swinging from the end of our fish hooks. It’s beyond delicious. Every evening, we soak dried fruit for our breakfast of granola, rice pudding or oatmeal. Lunches are leftover pickerel or picnics of cheese, sausage and canned salmon sandwiches. Most of the weight we carry is food. 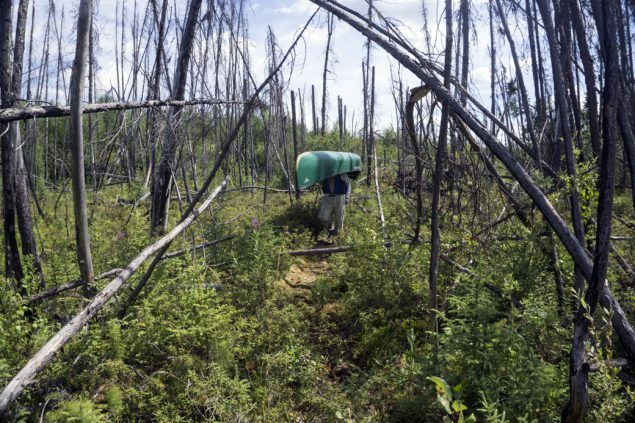 On one particular day, we are reminded of the dockhand’s words as we spend much of our time portaging supplies over three seldom-used trails strewn with deadfall, sinking up to our knees in bog. A fetid swamp caused by a beaver dam greets us at the entrance of our third portage. Frogs leap about our feet as we squish though stagnant black guck. Mosquitoes drone in the humidity that clings to dense, jungle-like foliage. We aren’t feeling so tough now. “This is the worst portage day I’ve had in my whole life,” complains one member — a man with decades of portages under his belt — of our group of six. My friend Damon swears he can’t go on. He’s offered an Eat-More bar for strength. I, on the other hand, am encouraged by sweet, succulent blueberries, in abundance everywhere and ripe for the picking. We all can’t wait to get back on the river. And I naively can’t wait to test myself in the rapids. Before each set of rapids, the experts among us pause to read the river as it roils through narrows. If the obstacles seem daunting, we opt to portage or “line” the canoes, pulling them along the river with ropes from the shore. At first, I find being a helmsman and having to watch for obstructions — rocks and logs that might lay just under the surface of the water — stressful. I’m also having to follow specific and often urgent directions as to the paddle strokes I need to do in order to follow the sternsman’s line. Thankfully, my skilled and patient paddling partner compensates for my inexperience we and our canoe emerge unscathed. Over time, I become a stronger paddler and a more efficient camper. I also learn to pace myself; otherwise, you risk wearing yourself out and missing moments of calm and wonder. What feeds me — in spite of physical challenges along the way — is knowing that I’m using my own power to traverse the same territory that traders, trappers, and woodsmen did so long ago. These days, with the trip behind me, I feel indebted to the experienced canoeists who invited me along on this rewarding journey, sharing their knowledge and ensuring my safety. And I’m sustained by my memories of northern Saskatchewan. The thrill of running rapids in a canoe, more exciting than any ride at the Calgary Stampede. The soulful sound of calling loons. A beaver swimming silently at dusk, nose out of the water, and a fan ripple left in its wake. — Don’t overpack because you’ll have to carry all of your own gear. — Be prepared for all kinds of weather. — Take a few refresher canoe lessons beforehand, so you can paddle as effectively as possible. — Travel with experienced canoeists and wilderness campers. — Pack a first aid kit, water filtration system (a gravity system over a pump system because it’s easier to use), a compass and a tarp. — Bring snacks to eat in the canoe throughout the day. Paddling is hungry work. Editor’s note: What’s that famous Henry David Thoreau quote? “Everybody must believe in something. I believe I’ll go canoeing.” We’re grateful neophyte paddler Anne Georg did just that and returned to tell the tale. Fantastic expedition, fellow canoeists….looks like everyone enjoyed themselves. Good for you guys……and I am glad that everyone was wearing a lifejacket throughout the venture. As a recovery scuba diver, I have seen far too many hardships amongst families….the message has to be passed on at all times by wearing such a vest while paddling under whatever climate and water conditions. I’ve wilderness canoed for the past 57 years since the age of 14 and have no plans in slowing down. Installed a tandem seat in my Prospector canoe for my twin granddaughters, and their participation has instilled all that much more in my life. Like my slogan says, “Paddle to Live, Live to Paddle”……it is what keeps me alive and focused at all times. My canoe ventures have been in southern Quebec during my youth, then throughout New Brunswick during my career, and finally Eastern Ontario after I retired.